A Highly sought-after ornamental shrub. Pinkish-purple flower buds and new stems. Easy to grow and low maintenance. Supplied as an established plant in a 4L pot. Ilex 'Blue Prince' is a large, evergreen shrub with dark, purplish-green stems and dark, bluish-green foliage. A male variety, it has small, star-like white flowers in spring but produces no berries, instead acting as a great pollinator for female varieties such as 'Blue Angel'. 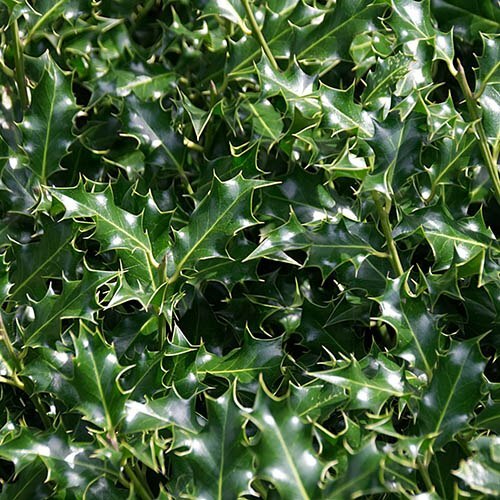 With larger, finely serrated leaves, which are not as spiky as its female counterparts, this holly grows faster than female varieties and has swiftly become one of the most sought-after varieties of ornamental shrub. A rather special specimen shrub with year-round colour, flower buds and new shoots are pinkish-purple, while mature Leaves are always very glossy and deep green, almost blue-green, hence its name. Blue hollies need almost no maintenance if you keep them well-watered for the first couple of years to enable them to establish. They are more or less trouble-free, growing moderately fast and making dense foliage in the lower parts while they push new branches upwards. This feature is employed when using this holly into a hedge. Supplied as an established plant in a 4L pot ready for planting out. Water well until established and add mycorrhizal fungi to the soil before planting. Plant in well drained, fertile soil in full sun or partial shade. No pruning necessary unless you want to shape the bush - ideal for topiary or hedging.